Chester B. Mahooty was an internationally known singer, dancer, and silversmith. You can hear him sing HERE. For 28 years, Mahooty’s Zuni Rainbow Dancers toured throughout North America, Europe, the Middle East, and North Africa. A master silversmith, Mahooty was noted for his exceptionally large turquoise jewelry and wore 65 pounds of turquoise and silver when fully dressed in his Zuni attire. While we don’t know the artist who made this bracelet, it is a striking piece that I wanted to share with you. 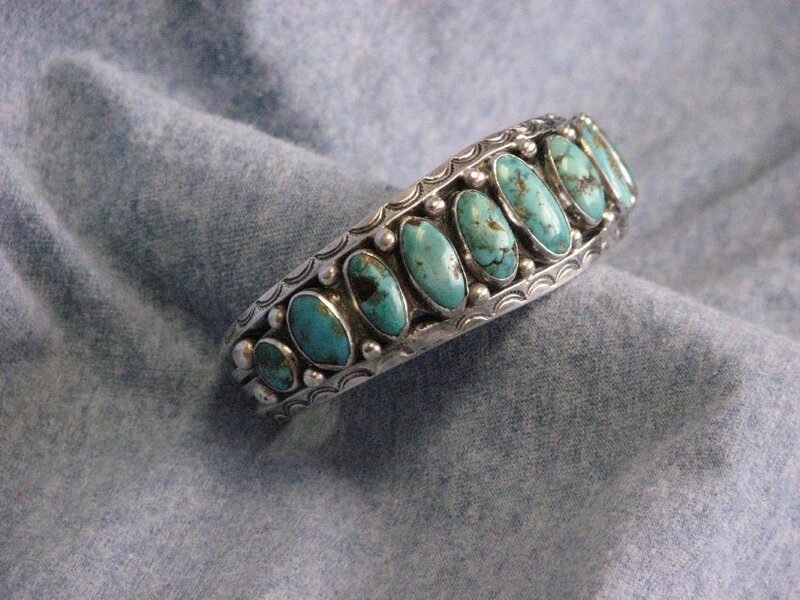 Cleora wrote, “This silver bracelet, etched with line designs, is set with turquoise. Although all of the turquoises are oval, the bracelet is obviously very old, for these stones are of all sizes and range in color from very green to dark blue-green, indicating that the silversmiths had not yet perfected their art of making stones on jewelry. I bought this bracelet from “Fonda Joe,” and Indian in Santa Fe, New Mexico in 1940.” I disagree with Cleora’s comment that the technique was not perfected. The stones are not perfect, but they are set in the silver beautifully. And the roughness of the stones gives a more natural look to the piece. 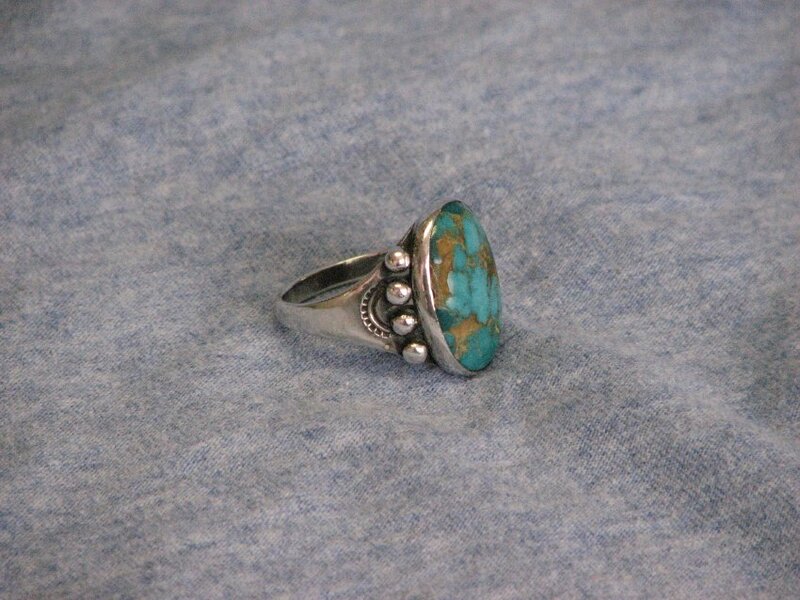 This silver ring is set with a large oval turquoise stone. 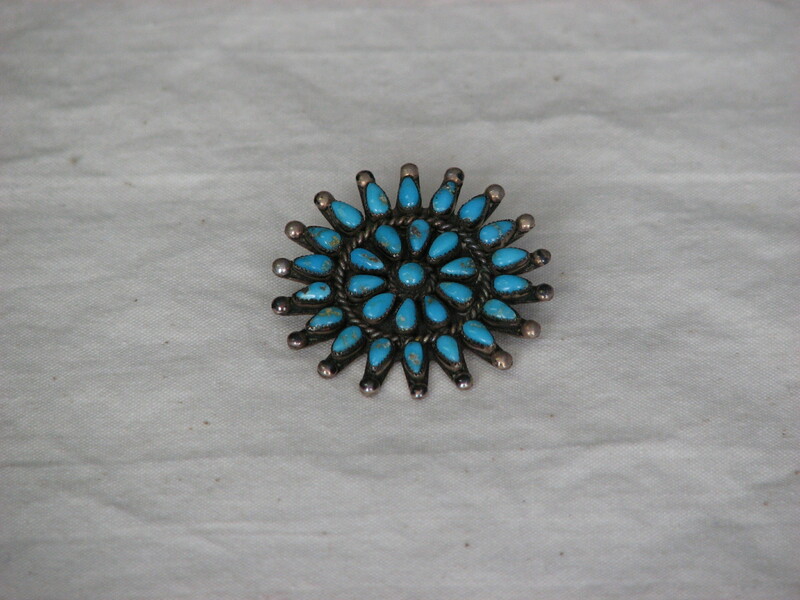 The turquoise has deep gold veins, a sign of value for a turquoise stone. Around the stone is a border of silver balls, four on each side. This entry was posted in Collection Notes and tagged A-Z, Chester Mahooty, Cleora Helbing, museum collection, Native American art, Navajo, silver, Silver jewelry, Turquoise, Turquoise Jewelry, Zuni. Bookmark the permalink.